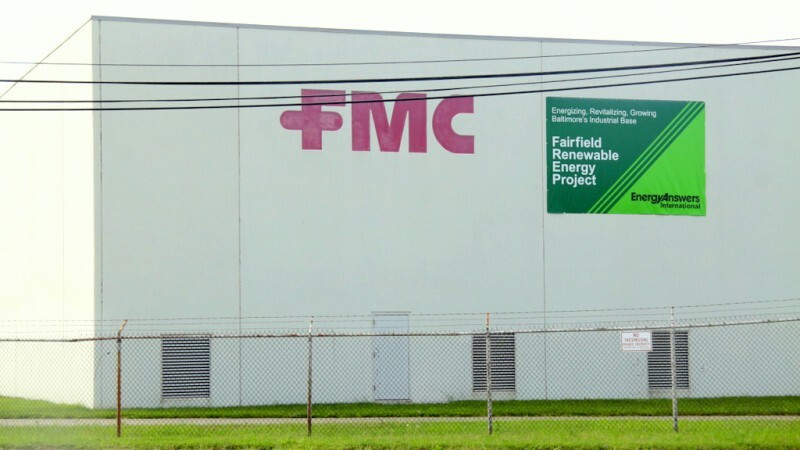 Above: The former FMC building is the site of Energy Answers’ proposed Fairfield Renewable Energy Project. Residents of the nearby neighborhoods of Curtis Bay, Brooklyn and Brooklyn Park, including the student-led organization Free Your Voice, have been organizing against the proposed 4,000-ton-per-day facility for years, saying it would add to the health problems of an area already burdened with toxic air emissions. “The incinerator would add more brain damaging lead and mercury to my community which is already the most polluted in the state,” said Destiny Watford, Curtis Bay resident and leader with Free Your Voice. Energy Answers spokeswoman Elona Cadman promised to provide a response to The Brew today, but so far has not. Under its state permit, the 160-megawatt incinerator would be allowed to burn shredded municipal waste, tire chips, auto parts and demolition debris and release multiple toxic substances into the air and water, including 240 pounds of mercury a year. Company officials have said releases from the plant would not pose an environmental or health threat and that the project would benefit the region by providing jobs and freeing landfill space. The groups argue that the company’s 2010 state permit to construct the plant expired on May 1. Under the Clean Air Act, approval to construct a source of potential air pollution expires if the company halts construction for 18 months or more. Construction stopped on November 1, 2013, the groups say. In December, seven protesters conducted a sit-in at MDE headquarters in the Montgomery Park building, refusing to leave until the agency issued a declaration that the permit had expired. The civil action came as as more than 100 protesters gathered outside the building chanting, “Pull the permit!” and demanding that MDE declare the project dead. The protesters were released from jail the next day and all charges were dropped. After the protest, the activists returned to deliver a petition signed by nearly 2,000 people asking the state to find the permit invalid.